This is my first as part of the What I Ate Wednesdays started by Peas and Crayons. I decided to "give it a shot" and see if I - and you! - enjoyed this little segment. I tried to include veggies and sneak some extras in - hello Simple Stuffed Red Peppers - in honor of "Love Your Veggies Month." Let me know your thoughts! Since I'm posting this first thing Wednesday morning, you can guess that this is not what I ate today. This roundup is in fact from Monday. Breakfast (8:10 a.m.): This was kind of lame because I need to go to the store. I always forget that when buying groceries I'll need to get enough for Monday, not just Friday breakfasts. I had a piece of sprouted 7-grain bread, lightly buttered, with two hard-boiled eggs with salt and pepper that I made last night using this fool-proof method! 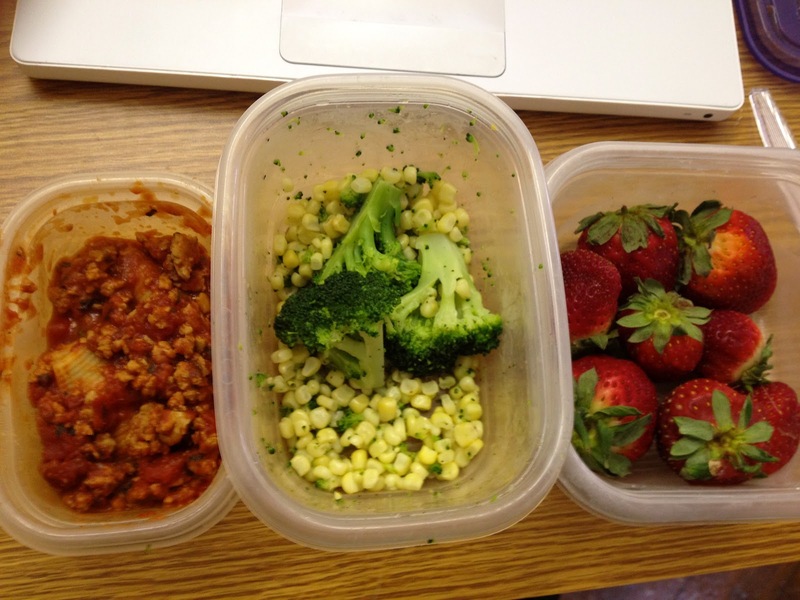 Lunch (11:15 a.m.): My kiddos have lunch pretty early, but I'm always ready for lunch when it rolls around. Today I had two leftover stuffed shells, covered in extra ground turkey marinara meat sauce. I also had frozen broccoli and corn, and managed to spill half of it in the office before I even got to eat it. Bummer. My meal concluded with some strawberries to satisfy my sweet tooth, even though what I really wanted was a piece of the super yummy cake sitting in the office...One point for willpower. 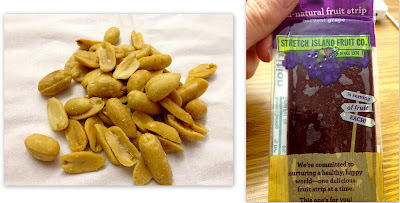 Snack (2:25): I was beginning to feel a little hungry, but mainly I knew I should have some food because I have outdoor dismissal duty today and no one wants to see a cranky teacher with low blood sugar. Enter small handful of peanuts I keep stashed in my desk and a fruit strip. Snack 2 (3:45): The dean hosts open office hours with snacks and treats every Monday. I love it! I stopped in to enjoy some cheese and crackers - I can never say no to that combination! - and some carrot sticks before heading to the gym for my workout. *Not pictured...didn't want to be a creep! 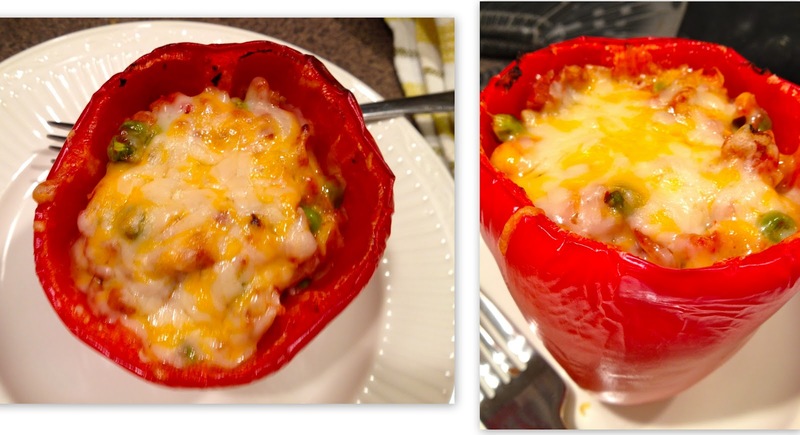 Dinner (7:15): After doing gym and grocery store (aka Trader Joe's) duty, I headed home to make a new recipe...Simple Stuffed Red Peppers. I ate one for dinner and was amazed at how full I was. Love this easy recipe! Just one of these was filling! 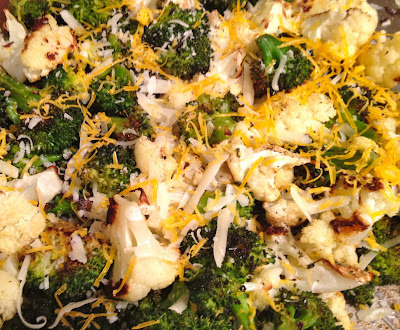 Snack (9:15): I made another new recipe...Garlic & Basil-Roasted Broccoli & Cauliflower. I had to at least try it when it came out of the oven...it was delicious. Post on its way. with a little cheese on top...still on the pan where I picked at it! Welcome to WIAW! 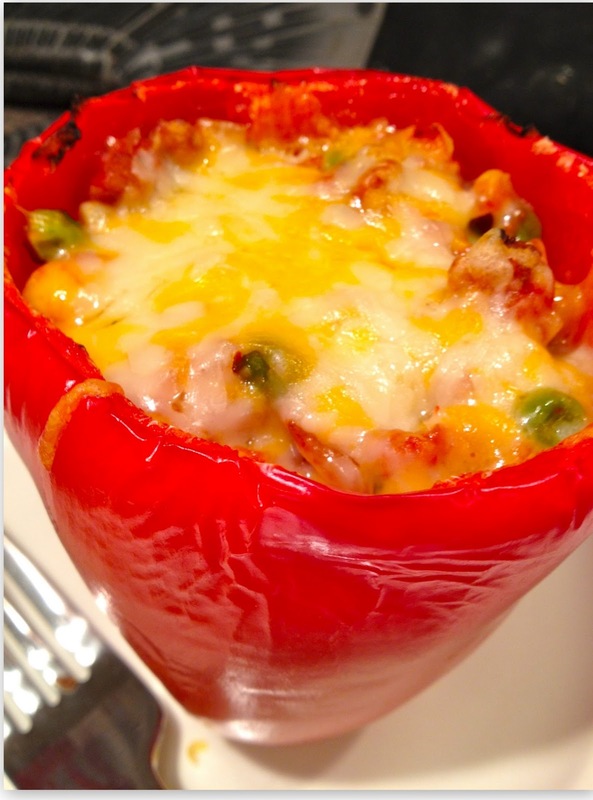 Everything looks tasty, especially the stuffed peppers! Thanks so much, Fran! :) Those peppers were great - and SO easy, which I love! Welcome to your first ever WIAW! I get so much inspiration from participating in this link up party. 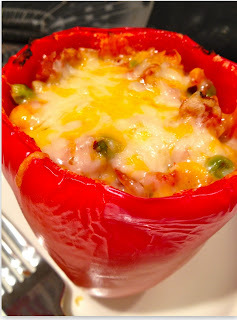 You had great eats - I really want to give those peppers a try - they look delicious! Yay! I love these new segments Lauren!